Allow yourself time for introspection and reflection, to gain insights into the way ahead. Grounding and is vitalizing to the physical body. Can help alleviate tiredness. Particularly useful to open and activate the Heart chakra. Assists one to integrate and ground Spiritual insights and wholeness into physical reality. When correctly grounded these insights are able to be integrated into daily life with ease. 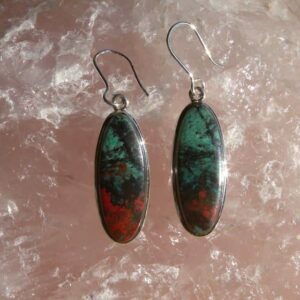 Chrysacolla is a stone of harmony. Bringing gentle Heart centred openness and communication.